A European paper wasp guard keeps a watchful eye at the entrance to the nest. In some 40 states in the U.S., the brown marmorated stink bug has become an inimitable pest of fruit, vegetables, field crops, and vineyards. Since its discovery near Allentown, PA in the 1990's, it has caused millions of dollars of damage. This scalawag has also delivered distress to millions of homeowners by invading dwellings in autumn to escape the ravages of wicked winter. Mischief caused by this exotic invader from Asia has been the topic of several previous episodes of Bug of the Week. For those of you who have had enough of this rascal, Bug of the Week has recently visited several predators that feast on stink bugs. Thus far, we enjoyed the curious reunion between the Chinese praying mantis and brown marmorated stink bug. We witnessed a close encounter of an arachnid kind between the stink bug and the yellow and black garden spider. And we also learned how another awesome predator native to North America, the wheel bug, dealt death to the stink bug. Recently, while visiting a community garden, I spied a pair of deceased stink bugs, belly-up on the leaf of a bean plant. The cause of their demise was a mystery. Perhaps a jumping spider dealt them a fangly death or maybe a gardener delivered them a lethal squirt of insecticidal soap. Who knows? But much to my surprise, a dazzling European paper wasp zoomed onto the leaf, surveyed the carnage, and proceeded to dismantle the deceased stink bugs. With ghoulish delight, the wasp nibbled the bugs’ legs and other body parts, intent on extracting one last meal from the hapless bugs. Even dead stink bugs do not go to waste when hungry European paper wasps are about. In previous episodes, we visited other fierce members of the vespid clan such as yellow jackets and bald-faced hornets. Like these predators, the European paper wasp spends most of its time in highly beneficial pursuits such as hunting small caterpillars in the garden. 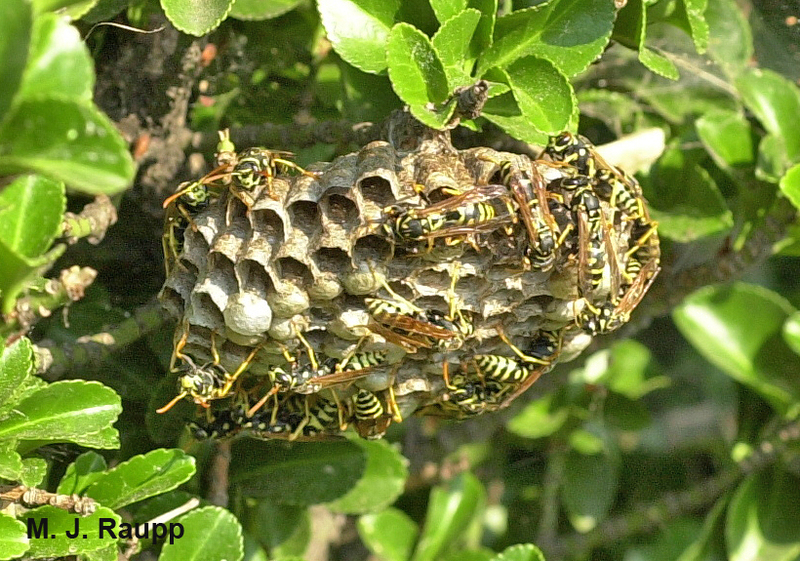 A paper wasp nest in a shrub can be quite a surprise to the unwary gardener. Paper wasps live in nests made of wood fibers that were initiated in spring by one or more founding-females that survived the rigors of winter in a protected location, perhaps under the lose bark of a tree. Often, females will return to the nesting site that was the place of their birth to build a new nest. In species of paper wasps where a single female founds a nest, the foundress lays eggs and cares for a brood of sterile workers destined to help her raise their sisters until males and new reproductive females are produced later in the year. In other species of paper wasps, more than one reproductively competent female may found a colony and this is where the trouble begins. Shortly after the colony is established, founding females engage in highly aggressive contests to determine who will earn the right to reproduce and populate the colony with offspring. These encounters are called ‘falling fights’ as females sometimes tumble to the ground while they wrestle, bite, and sting each other. Falling fights are brutal and sometimes result in death of the loser. In many species of paper wasps, the dominant foundress maintains order in the colony by chasing, biting, and otherwise harassing subordinate foundresses. In other species, including the European paper wasp, the order of rule may be more subtle. The dominant female may selectively eat eggs of her subordinate nest mates should they be so bold as to attempt reproduction. Having demonstrated her mettle, the dominant foundress gains the privilege of populating the colony with her young while the other foundresses wait in the wings tending the nest. If a bird should come along and eat the ruling tyrant, a subordinate female may ascend to the throne and establish a new reign of tyranny. Subordinate foundresses may attempt to usurp the power with the dominant foundress in battle, but often the seated foundress is the victor. The hollow log beneath this flower pot offered a perfect spot for the nest of one paper wasp queen with a flair for the unusual. In addition to dramatic confrontations, paper wasps engage a variety of behaviors involving vibrations of the body, wagging of the abdomen, and drumming of the antennae. Although the meaning of these actions are not entirely understood, they are thought to be ways that adults communicate with developing larvae to gage their hunger level or inform them that dinner is about to be served. Furthermore, some of these behaviors may help the dominant foundress direct activities such as foraging for food or wood pulp for nest construction or to suppress unruly behaviors of her subordinates. In late summer and early autumn, a premium is placed on gathering enough food to ensure the production of next year’s batch of foundresses and their mates. Apparently, even the bodies of dead stink bugs do not go to waste as European paper wasps rush to complete their biological imperative in advance of approaching winter. The wonderful text “The Biology of Wasps” by Kenneth Ross and Robert Matthews was used as a reference for this episode. Support for our research on BMSB comes from USDA-NIFA SCRI Award #2011-51181-30937.